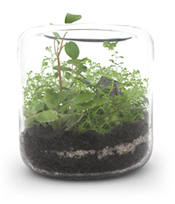 Since every terrarium is made per order, you may have to wait three to four weeks for your terrarium. Hardy, wild ground covers, ferns, an african violet, and numerous other plants are the focus of this dense woodland terrarium. Decorative rocks serve as a beautiful contrast against the ample greenery. A glass lid is included. This is not just another desktop office garden in a clay pot. 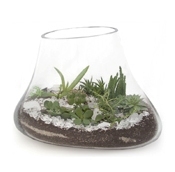 Carefully chosen plants, colors and textures are set off against sand and crushed glass carefully composed in an organically shaped hand blown glass vessel. A simple glass cube serves as a window on nature. Moss is mounded into a woodland landscape complete with a fern and various indigenous species. The closer you look, the more you'll find. Mosses contain interesting dormant seedlings. 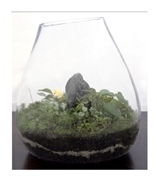 Size = 12" x 12" x 12"
Size = 18" x 18" x 18"
A hand blown terrarium complements the natural shapes of mosses, clovers, a rare flowering gem, and myriad other plants. A rock, carefully selected for proportion, serves as an excellent background for the foliage. A variety of six ferns pop against various shapes and sizes of sea glass. Ground covers and miniature ivy peek through the glass and will continue to push through the crushed glass. The plants are delicately composed in an organically shaped hand blown glass vessel. Let the ferns fill out the terrarium or keep trimming for a more minimalist look. Air plants, a.k.a. Tillandsia cling to branches for a weird yet beautiful look into the world of these oddities of nature. These curious plants don't grow in soil, but do enjoy an occasional misting and weekly soak. You don't have to own five acres of land or travel to Japan to appreciate the Taoist proportions of nature. A Zen garden has been created on an island sitting atop an ocean of polished stones... A hill of moss highlights a dwarf bonsai, a diminutive shrub, and a tiger striped stone. These exotic beauties are virtually carefree. Give them damp conditions, good light, and a humid environment (which a lidded terrarium provides) and these plants will thrive. They tolerate temperatures between 40 degrees - 95 degrees! The pitchers' of the Pitcher Plant contains a digestive liquid that will trap unsuspecting insects. Squeamish about feeding? Leave the lid ajar to provide the plants with food or give them a monthly treat of an insect found outside or around the house. Seeking the sun amongst the canopy, air plants (Tillandsia) climb a branch in a tall cylindrical vase. Tillandsia don't grow in soil, but do enjoy an occasional misting and weekly soak.